Abrams’ public record in Latin America and elsewhere, as an official under Ronald Reagan and George W. Bush, ought to be central in any reporting on his current Venezuelan adventure. But it only really got on media’s front burner when Abrams’ was confronted with it by Rep. Ilhan Omar in a House Foreign Affairs Committee meeting, an exchange then subsumed in media’s “Hot Controversy of the Day” framework. Joining us now today to talk about some of Elliott Abrams’ keenly relevant and not-that-old history, is Jon Schwarz. Contributor to many outlets, he now writes for the Intercept. He joins us now by phone from Brooklyn. Welcome to CounterSpin, Jon Schwarz. Jon Schwarz: Thank you so much for having me on to talk about this. It’s an extremely grim story, but also extremely important. The idea that Omar was speaking from ignorance—set aside her purported incivility as the conduct with which we should be concerned—but the idea that she was factually wrong, that she doesn’t know her history; for reporters to let that stand, as if to say, “who’s right depends on who you like”—it feels like an abdication of duty. So I wanted to ask you to talk about Elliott Abrams’ public record, some of which you have revisited recently. We don’t have time to do it all justice, but what leaps to mind when you hear Abrams tout his “support for Latin democracy”? JS: Yeah, well, Elliott Abrams supported Latin American democracy pretty much like Jeffrey Dahmer supported all the people that he brought to his apartment. That seems like a crazy thing to say, to people who are not familiar with Abrams’ history. It actually is not. The violence that Elliott Abrams supported in Latin America during the 1980s, particularly in El Salvador and Guatemala, is unspeakable. Human beings literally do not have the words to describe this kind of thing, and all we can do is use the limited vocabulary that we do have to try to communicate it. JJ: Right. And I think in particular, when Omar was asking him about El Salvador, if we can start with that, because it isn’t just that he described what happened in Salvador as, I think his words were a “fabulous achievement,” I’m not sure, but just that for years afterwards, he continued to deny that any horrors had taken place, right? Well, here’s part of the “fabulous achievement.” Elliott Abrams became assistant secretary of State for human rights and humanitarian affairs on December 12, 1981. Literally when he walked into his office, the Salvadoran military, which was just off of being trained and armed by the United States, was conducting one of the most notorious mass slaughters anywhere on Earth over the past 40 years or so. This took place in El Mozote, which is a small town near the Honduran border in the mountains of El Salvador. It was kind of My Lai times two or three; around a thousand people were killed, men, women and children. Every woman over the age of maybe ten was raped before being murdered. It was as gruesome as pretty much anything in human history. So he walks into office, as the assistant secretary of State—let me say this again—for human rights and humanitarian affairs, and he snaps into action and covers it up. So I want to say, you almost don’t have to hide this record of what Elliott Abrams did in Latin America, if you are going to at the same time say that, for example, in Venezuela, “Well, we’re gonna push for a coup for democracy,” and you’re just gonna say those words with a straight face. 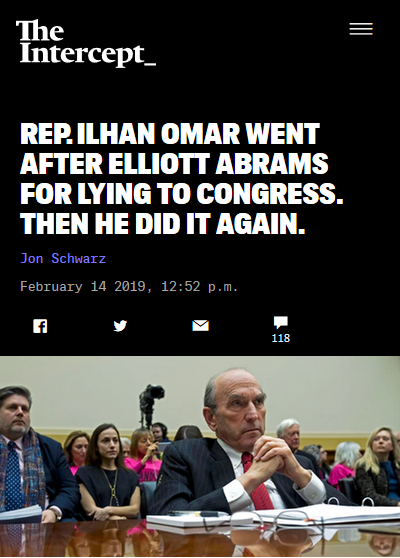 And so in some ways, the lying—and you’ve written about this—the lying and the PR and the massaging of the truth is as much a part of what we need to know about Elliott Abrams as what he actually supported. JS: Yeah, just the language is remarkable. It is like someone saying, “Well, I’m a doctor, so I’m going to shoot you in the face for your health.” And the El Mozote story, this is very much a media story. One of the things that Abrams and his compatriots in the Reagan administration did, when Raymond Bonner—Raymond Bonner was a New York Times reporter—got into El Mozote, he broke the story of what had happened there six or seven weeks afterward. And the Reagan administration did everything they possibly could to try to knock the story down. They attacked Raymond Bonner personally. And they succeeded. They went straight to his editors at the New York Times and they got him pulled off of his assignment in Central America, brought back to New York, put on a desk that was a clear demotion. And it really just derailed his career, frankly, for decades. And so that’s what happens when you report the truth in the New York Times: If you’re going up against Elliott Abrams, you’re going to be punished, and punished severely. JJ: And that record of his involvement with the press is part of his record, and for some folks, as you’ve noted, it isn’t just that he…well, I mean, it is that he attacks them, but it’s also that he kind of breaks ’em, you know. Reporters that are trying to rely on him as a source and trying to report reality from areas in which he has influence, some of them just get kind of worn down, it sounds like. JS: Yeah, I read about one who was working for the Washington Post and had to deal with Abrams. And she later said, “They said that black was white…. Although I’d used all of my professional resources, I had misled my readers.” And she just found dealing with them so unbearable and exhausting that she quit to write novels. JJ: And then, I guess I have to come back to, you’ve started to talk about, or you’ve indicated some of the actual horrors—horrors is the right word for what was done under US auspices and with US support in Salvador, in Guatemala, in…. But this brings us back to: Journalists are now going to be going to Abrams, quoting him as a source. And these are journalists who have to know that he has a record of lying—and proudly lying—to Congress about US involvement in Nicaragua. And that’s the funny thing about Elliott Abrams. He was pardoned by George Bush I, as George Bush I was on his way out the door after losing to Bill Clinton in 1992. Now, he pardoned a whole bunch of Iran/Contra people; one of them was Abrams, so his record was wiped clean. And that was the end of his career in the Reagan administration, but he would return later on for George W. Bush, and do pretty much the same stuff. JJ: Which is funny, because they thought maybe he couldn’t get Senate approval, but they found a way around that. JS: Yeah, that’s right. So they put him on to National Security Council positions, again with names in his titles involving human rights and democracy. And it’s kind of like John Bolton, who is Trump’s National Security Advisor. Like, it would be very tough to get a Bolton nomination through the Senate. And so you can stick these people on the National Security Council, which does not require that kind of approval. JJ: And they can have enormous, enormous influence, which I think we’re seeing right now. Now Abrams is being covered in the context of Trump administration policy in Venezuela. And we’re seeing, for example, stories about whether or not weapons might be smuggled in humanitarian supplies. And it’s almost as if, ”Let’s come to that as though it’s a new thing,” you know, with regards to Abrams. Missing the history is always a bad idea for media, but when it comes to Abrams, it really means missing the story. JS: It is incredible. It is like reporting on Elvis Presley and being like, “Is it possible that this fellow might like to sing some songs?” Like, this is what Elliott Abrams does; of course you have to expect they’re going to be smuggling arms in the humanitarian supplies. He did that in the past, he’s in charge now, probably that’s what he has in mind. JJ: Nowhere along the line did he say, “That was a mistake; I’m changing my ways,” you know? JS: Yeah, exactly. If he were truly remorseful for what he did in the past, he would not be getting hired again. JJ: Let’s come back to media; I wonder if I can ask you, because I do think it’s the big story in some ways: In a recent piece, you reminded readers about when Elliott Abrams was on Charlie Rose with Allan Nairn, and he kind of said, “Here’s what I’m about, and here’s how you should deal with it.” Can you remind us of that story? And that actually is a pretty fair point from Abrams. It’s not like he somehow fooled Ronald Reagan, that he fooled George W. Bush. I mean, they knew what he was doing. He was doing what they wanted him to do. And this is US foreign policy; this is what it’s like. There are doves and there are hawks, but the difference between them is not that great. And if you were going to put the hawks on trial, if you’re going to be honest about it, you’re going to have to put a lot of the doves there, too. And so, to me, this kind of stuff is always like Murder on the Orient Express, right? So somebody ended up dead. And the question is, “Well, who killed them?” The story is, there are, well, I think there’s 13 possible suspects on the train, 13 passengers. The answer is, they all did it. JS: They all committed the crime. Abrams sees that as a very powerful defense, and it is. Like, the US foreign policy elite does not like the idea of all of them going to jail together. JJ: I kind of feel that elite media co-sign that line of thinking, you know? That they sort of play both sides in terms of their foreign policy coverage. “This is for grownups,” you know? You just gotta accept as access to the conversation that, you know, “We kill people and we do that to protect our stuff.” And then out of the other side of their mouths, they say, “This is for the babies. Don’t you care about the poor babies?” I mean…. JS: Well, why don’t you care about the babies like we care about the babies? JJ: Exactly. I just finally….for those of us trying to make sense of the world with media, how do you even do that? I mean, you can’t rely on corporate press. JJ: Right. Well, I guess, finally, for those of us who don’t subscribe to that, we need to find other outlets for our conversations, and other folks to include in those conversations. JS: Yeah. The good news is that we have 99 percent of humanity on our side. So hopefully, eventually, that will count for something. JJ: We’ve been speaking with Jon Schwarz; you can find his work on a variety of issues on TheIntercept.com. Jon Schwarz, thank you so much for joining us this week on CounterSpin. JS: Thank you, thank you and thank you to everybody listening. This truly is an important story, and I think that it really deserves everyone’s attention.